Status: Restoration completed July 2013, and returned home to its owner. 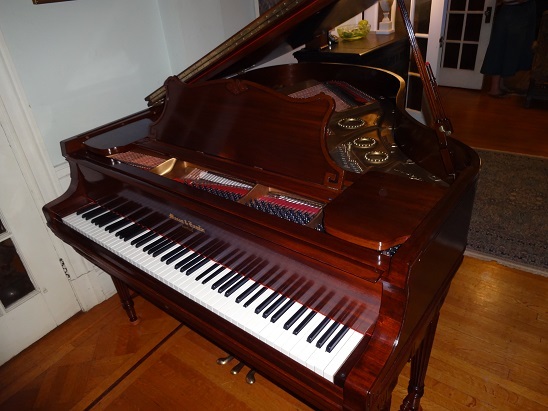 This beautiful and rare Georgian artcase mahogany Mason & Hamlin 5'8" grand came to Historic Pianos in early 2013 as a collection of hundreds of loose parts, that its owner wanted restored. This instrument is one of the later Mason & Hamlin instruments built in Boston in 1929, shortly before the highly-regarded company merged as a subsidiary of the American Piano Company and moved manufacturing operations to Rochester, NY. This instrument had suffered significant damage to the casework and action from age, neglect, water, and animals including both moths and pets. But the instrument was well-worth restoring, not only because of the rarity of Mason & Hamlin Ampicos, particularly with the Ampico B system, or only because of the beautiful artcase design, but also for the superior acoustic design of this Boston-made instrument. Restoration of the instrument began in early 2013, and was completed in summer 2013. Work began with the fitting of a new pinblock, followed by soundboard and bridge repairs. The case was repaired, including replacement of missing spindles in legs and sections of severely damaged case veneer. The soundboard, legs and main case were refinished in traditional French polish hand-rubbed shellac. The string plate was cleaned, regilded, relettered, and fitted to the new pinblock and case. Metalwork including pedals, rods, agraffes, hinges and screws were polished and lacquered where appropriate. The original stringing scale was measured and analyzed, and custom bass strings were ordered. The instrument was restrung with new stringing felts and treble wire. The action was fully rebuilt, with repair of whippens and key levers, and with new key tops, new knuckles, and new, custom fitted German hammers. The remaining case components, fallboard, lid, music rest, etc., were also refinished with new French polish shellac. The player was restored with new pneumatic cloth, tubing, and extensive repairs to water-damaged components including the main stack lifter rods. The drawer was also fully restored, with fabrication of missing panels, new tubing, and a substantial redesign and rearrangement of components in the drawer to allow for installation of a rare Ampichron system, which effectively allows the Ampico B system to function as a self-running grandfather clock, playing chimes or roll selections at predetermined intervals and times.